Some of the toys for sale at the Plaza shopping center in Narooma. The designs featured made from some of the free plans available on this site. 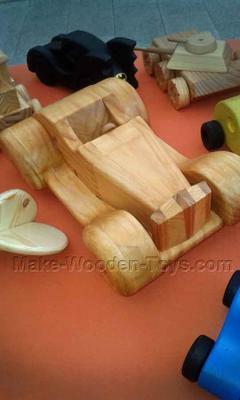 The racing car was made to emphasize the wood grain with a piece of maple in the middle. 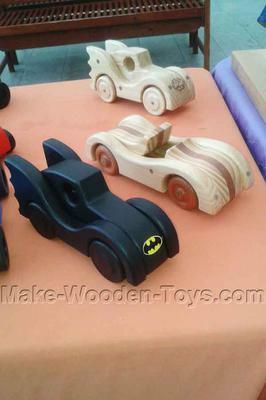 Two versions of the rocket powered Batmobile with a Batman sticker. The toy road grader in a natural finish. 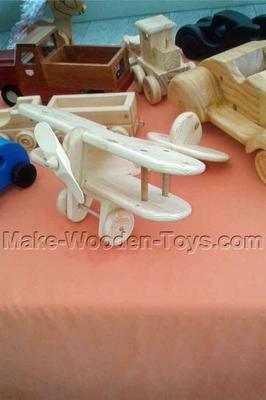 The biplane very nicely made, also in a natural finish. The prototype of the toy car roadster, this one without the rumbler seat. 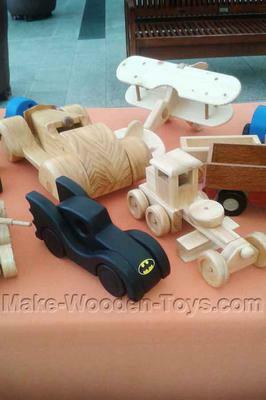 There are also other items made of wood for sale. Last time they raised about $170. Hope they all go to a good home.